Machines of class 211A, 211U, 211G, and 211W have been in production since at least 1960. They incorporate design and parts of the class 111W and 111G machines. 211A and 211U machines are the same except; the 211A is painted white, the 211U is painted a light brown. 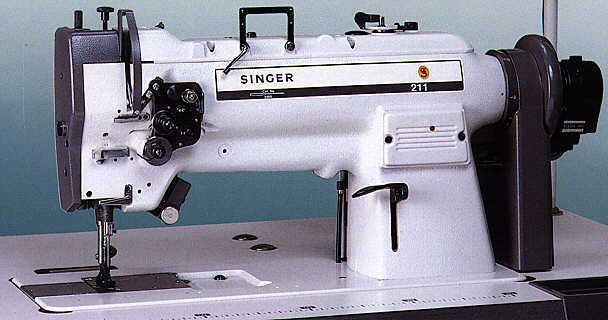 They excell in their ability to combine high speed with the ability to stitch medium to heavy materials. SOME MODELS with ALTERNATING PRESSER FEET with DRIVEN VIBRATING PRESSER FOOT. For stitching medium and heavy weight materials inlcluding leather. Especially adapted to all difficult to feed work and/or multiple layer work. Used for upholstery, awnings, canvas, luggage, automobile trim, coats, leather coats, gloves, overalls, heavy clothing, etc. Bobbin case opener for heavy thread. Automatic lubrication of all moving parts. Proper lubrication of parts at both full speed and lowest sewing speeds. Superior disc type safety clutch compared to 111W latch type clutch. Disc clutch is virtually maintenance free compared to latch type clutch. Disc clutch allows both lighter and heavier adjustment compared to latch type clutch. Independently adjustable upper and lower feeds (some models) helps seams lie flat. Full set of superior journal bearings reduce feed overthrow. Reduced feed overthrow provides a consistent stitch length at all speeds. Solid, machine casting mounted Knee Lifter for presser foot. Optional foot lifter can be used in conjunction with knee lifter and hand lifter. Drop feed and needle feed (compound feed). Hook height adjustment allows a wide range of threads to be used. Hand operated reverse feed. Foot operated optional. Independently adjustable forward and reverse stitch lengths. Quiet, independently timed, 1:1 ratio with the arm shaft Bobbin Case Opener. Hook is removable without disturbing hook shaft. Applications include irregular thickness, extra thick, hard or soft materials, slick or sticky materials. Drop feed and needle feed (compound feed) with alternating presser feet with driven vibrating presser foot. Push button armshaft eccentric adjustment for climbing height of feet. Does not change in use. Bed Size 18.75"x7" 18.75"x7" 18.75"x7" 18.75"x7"
Work Space 9.7" 9.7" 9.7" 9.7"